Social selling is a sales technique that involves utilising social networks in order to find and interact with prospects in B2B markets. 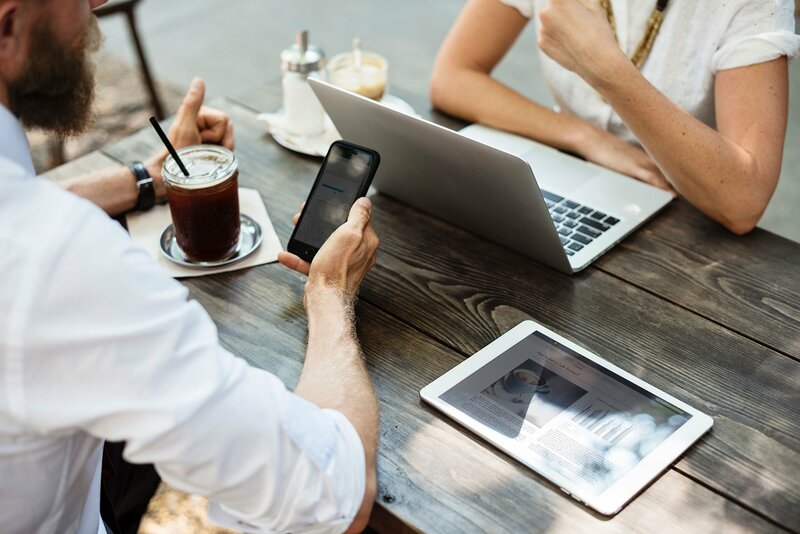 Before contacting a prospect with a pitch, salespeople should make meaningful connections and provide value to their prospect to make a more targeted and, ultimately, more successful sales pitch. You might think that social selling is pointless, especially if you're in an industry where people aren't so active on social media, or if your current sales approach is working well. However, consider the fact that 78% of salespeople engaged in social selling are outselling their peers who aren't - is this an opportunity you want to miss out on? You may also think your prospects don’t use social media and therefore adopting a social media focused strategy is pointless. This actually may be misguided as 82% of prospects can be reached via social media. You won't know until you try! The great thing about social selling is that prospects are receptive to being sold to via social networks. In fact, LinkedIn claim that 76% of buyers are happy to have a social media conversation with sellers. 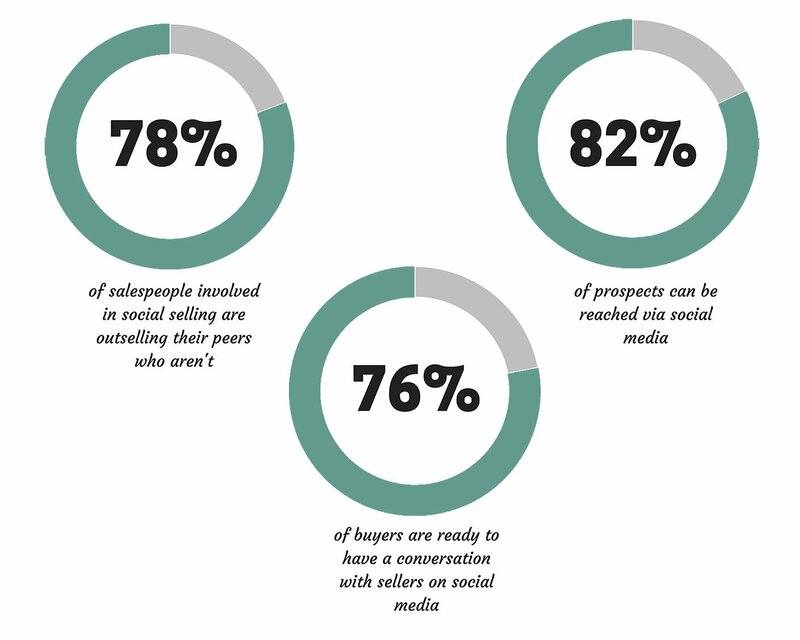 These social selling statistics show that social sellers outsell their non-social selling peers, prospects can most definitely be reached via social media and that buyers are willing to be sold to via social media. Social selling works! How to do social selling? In order to be successful at social selling, you want to position yourself as a reliable and trusted source within your industry. To become a credible source, you should always be aware of emerging trends and research. Become a trusted voice by ensuring your information is correct. You must have a consistent tone across all social networks. If people appreciate the content you create and the value you provide through engagement with their posts, they are more likely to be receptive of your pitch once they identify a need for a product or service like yours. Creating value doesn’t mean trying to sell your product on every post your prospect makes, you need to be prepared to put in some hard work and have meaningful interactions before you can begin pitching. This also means you can't rely on bots to make comments for you, this will be painfully obvious and can seriously damage your brand. You also want to position yourself as a solution to a problem that your potential buyer has. You can do this by keeping an eye on their posts and swooping in with a well-timed and well thought-out proposal when the time is right. People will be much more likely to engage with you if you let your personality show. Business has become much more social, and this needs to be reflected in your communication tone. Have genuine conversations with your network and always focus on building a relationship before making a sale. LinkedIn is probably the best tool to use for B2B social selling. This is because it's designed for business networking, not personal sharing, and it is the network most prospects would expect to be contacted on. There are a few tips to bear in mind to make sure you're making the most of social selling on LinkedIn. You should ensure your profile is up-to-date and complete. LinkedIn helps you with this by measuring your profile strength and giving you tips on how you can achieve ‘all-star’ profile status. A couple of other ways to bolster your profile is to ask your colleagues to endorse your skills and also to possibly write you a glowing recommendation. Also, be sure you have completed the ‘summary’ section of your profile. This should be a brief explanation of what value you can provide to people and how you go about solving prospects’ needs. Connect with as many people as you think are prominent or relevant in your industry. When asking to connect with someone, send a personal note explaining why you wish to connect with them; this is much more personal. If you share a mutual connection with someone, ask to be introduced. Increase your presence on LinkedIn by joining groups as they are a valuable place to network and make yourself more visible in your industry. The best way to get your network engaged is by writing thought-provoking updates, or asking questions that are likely to garner a response. The more traction your posts get, the more likely you are to get people connecting with you and potentially enquiring about your product or service. This is especially true if you are valuable, reliable and authentic. Interact with other people's posts - especially prospects. Like their updates, answer their questions and help solve their problems. Share articles relevant to your industry and make a comment about them. This helps position yourself as a thought leader. Try LinkedIn’s social selling index tool and check your social selling score. Those with a higher score have 45% more sales opportunities. LinkedIn Sales Navigator is a paid tool to help you with prospecting. It can find new leads, reach out to them with personalised messages and also recommend potential leads. On Twitter, you have the possibility to create lists to monitor potential leads and your competitors without having to follow them. Your leads list should be used to make sure you don’t miss an opportunity to help them out with something. It could be a business problem they’re having which you could offer advice about. Never miss a chance to offer value! A great tool to use for Twitter analytics and insight is ex-Moz tool, FollowerWonk. If your industry has a relevant hashtag that your prospects or competitors seem to be using, make sure to keep an eye on it to stay updated on the latest news and trends. Don’t forget to like, retweet and comment on relevant and interesting posts you come across – engagement is key. One great example of a company using social selling in a B2B market is Santander. Santander use LinkedIn and for them, it's been a winning strategy. You can read more about the specific techniques they use here. Want more information on social selling? Sign up for a 14-day free trial of Plecto now. No credit card required.